So the second kind of thing I did this past month was not exactly new to me–I argue with people all the time, and I argue with Dave White rather more than I argue with most other people. 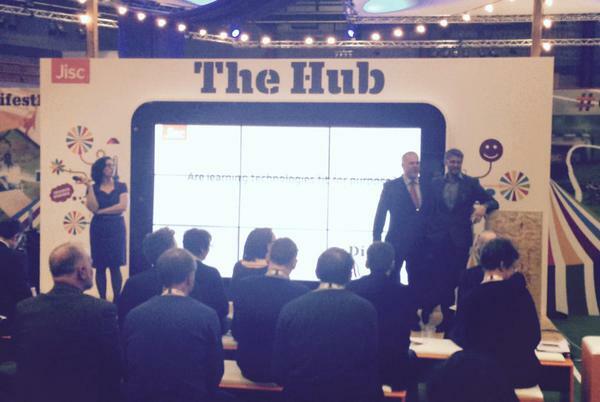 But Lawrie Phipps invited myself and Dave to argue with each other about something in particular–whether or not education technology is “fit for purpose.” We were on a central stage in Birmingham, at Jisc’s second ever Digifest, and I had a marvelous time. It was theatrical, occasionally shouty, and I think an engaging provocation. Lawrie has already blogged about the debate here. I should say that Dave and I deliberately chose polarized positions that were not necessarily reflective of our own beliefs about edtech. I should also say that what I was arguing (NO THEY ARE NOT FIT FOR PURPOSE) was a lot closer to what I actually believe, with Dave taking on the techno-brutalist end of the stick for the sake of inspiring people to think about what they actually believed to be true. The audience reaction to Dave’s argument fascinated me–we were, it should be said, in a room full of edtech professionals (It was a Jisc event, after all), and it should not have surprised me that there were many voices in favor of VLEs and ePortfolios in the (substantial, and nicely engaged) audience. I was surprised at the arguments made for VLEs that were less about education and more about administration, scale, and the tracking of student information. So I don’t object to those reasons, but dispute that they are educational ones. I’d rather institutions be transparent about what they actually use these systems for–education as I defined it in the debate isn’t necessarily central to the institutional argument for edtech. Technology in the service of a broadly-defined education should be more open, more flexible, less locked in to institutional priorities, because that is what we are intending to send our students out into, an open world with open systems. Digital citizenship, practiced responsibly, can start in university settings, and does not have to be within “walled gardens.” I made the argument (and I do believe this) that such protected systems can actually be failures on institutions’ parts, failures to scaffold students within the systems on the open web they will need to evaluate and navigate in their post-university future (and in their present, for that matter). What if they money we spend on contracts to companies that manufacture these systems was spent on staff and training and time to become true bricoleurs of the web, and facilitate the skills of our students, too? They need to be fluent and savvy in the ways of the open web, see the ways that current and future digital places can be relevant to their scholarly and professional futures, as well as their personal futures. Institutions who do not facilitate and mentor students through the open exploration possible on the web not only look like idiots, but are actually getting in the way of processes their students need to engage with to become effective, informed citizens. We can talk about what that might look like, but my point is it can and should look a wide variety of ways, ways that are only discoverable once we break free from the institutional edtech model, and move out onto the open web. A Domain of One’s Own is one of the best models I am aware of, but we’ll never know what else we can do if we don’t stop relying on one-stop solutions. In the end, I was quite pleased that, given the venue, I managed to have the support of half the room in person, and 45% of the vote overall. You can find the recording of the debate here, on Day 1, at about 5 hrs 29 minutes (you will have to register with the site to view, sorry). The best arguments are among friends. This entry was posted in Uncategorized and tagged #digifest15, #edtech, #LostMarch, academic work, presentations, travel on March 31, 2015 by dlanclos. Well I am back in Charlotte, after nearly a month away from home, and am realizing that I can divide my time in March chronologically, spatially, or in terms of genre. I think I’ll try the last one, as it occurs to me that I really did to several different kinds of things in my travels this past month. So I’ll post briefly (or, uh, not so briefly) here about the workshops I got to facilitate, not in the least because I want to have a centralized place to collect the links to all of the blogposts other people have written considering the content of those workshops. If I’ve missed any, please let me know! I will edit. In Galway, thanks to the generous invitation of Catherine Cronin (and the sponsorship of the National Forum for the Enhancement of Teaching & Learning in Higher Education in Ireland), Dave White and I got to pilot a version of the Visitors and Residents workshop we’ve been working on for a while. We blogged about it beforehand here. And Catherine interviewed us about the V&R workshop process the day before we did the pilot. Catherine blogged about it afterwards here . And Sharon Flynn Storifyed it here. What I’d like to emphasize here is how pleased I am with the steps Dave and I took to make sure that the people attending the workshop (who were so enthusiastic! Thank you!) came away with something concrete (we call it the “So What” part, see the entire workshop template in the .pdf here). We not only discussed the V&R concept, but consistently connected it with practice. People were encouraged to reflect on their own practices, recognize the differences in the practices of their colleagues, and last but not least, think about (and articulate) ways they wanted to move their own practices going forward. They did this by first mapping what they did on the V&R pole chart. Then they “toured” the maps of their colleagues, and eventually annotated their own maps with the meaning/content of what they originally mapped, as well as their aspirations for the new or different. 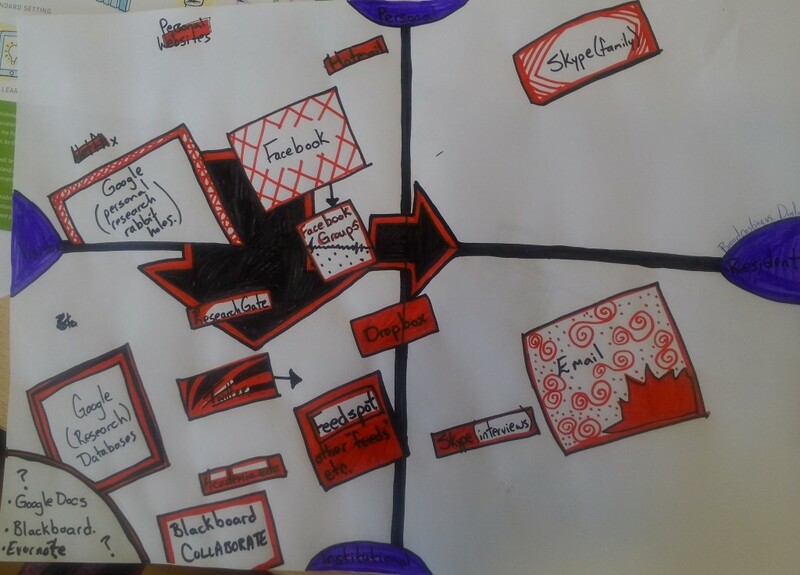 Map from one of our participants. Arrows show direction in which they want to move their practices–FB more Resident, for example. Some people wanted to engage in new digital platforms. Some wanted to stop engaging in some places so as to have more room to develop elsewhere. Some people saw how much their practices reflected their work, but not their personal lives, and resolved to think more carefully about the time they were spending online in all aspects of their lives. The power in workshops like these is in providing moments people would not otherwise have to really see, and think about, what they are doing. Too often we engage with digital tools or platforms because they are there, or recommended, or because people are there, but don’t have the space to think about why. When people put a presence into a platform but then never really use it, why should they have that presence at all? Being deliberate about motivations to engage can provide people with important chances to make careful choices about the limited time they have for f2f and digital interactions. I think one of the best things we did in this workshop was make sure there was someone in the room (in this case it was Sharon Flynn) who could make concrete suggestions to people in the room about where they could go for institutional help in learning more about the things they wanted to change and develop. Too often when we do this workshop at conferences we are reduced to hand-waving and “I hope you can find someone to help you!” Being able to hand participants off to specific next steps was indeed Marvelous. If you want to see what it was like, a recording of the session is available here. I think the most important thing I needed to get right at UXLibs was my workshop on ethnographic methods. It was planned and conducted in conjunction with my colleagues Andrew Asher and Georgina Cronin, and the intention was to equip all of the teams (read more about the overall picture of UXLibs here , here and also here. Ned Potter blogged specifically about the ethnography day here) with a range of instruments and approaches to use for their project in the Cambridge libraries. My workshop was on observations, and while I gave them a basic handout about domains, etc., I really wanted them to just pay attention and note what they saw, and then mindfully write it up. Participants worked in pairs (or teams of 3) and had to pool their observations into a coherent narrative at the end. 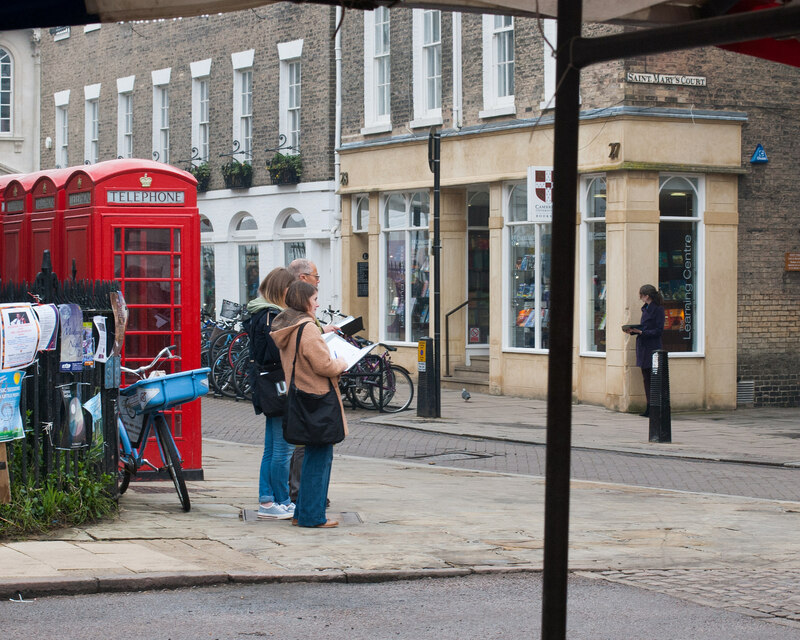 In Cambridge I sent them out to the Market Square, which bustled with people. Some teams went inside to a bookshop, which bustled less, but they all had plenty to write up. Our discussion post write-up was less about what they observed, and more about the process. Without much prompting on my part we got to discuss the observer effect, ethical obligations for researchers working in public spaces, hazards of interpretation, and the limits of observation as a method (i.e., what else do you have to do to get to a better understanding of what is going on?). I was terrifically pleased–after the rush and bustle of observations, the discussion was fairly low-key, but I felt like everyone dug into the issues and came away with the things in their heads they needed for the afternoon’s fieldwork. My colleague Andrew Preater invited me back to Imperial College to work with library staff members with regard to both ethnographic techniques and V&R mapping. Eleni Zazani blogged (very kindly!) about it both parts of the day here. Most of the participants had done the V&R mapping before, but I had not had a chance to try the “So What” part with them, yet. They really came through, annotating maps and talking with each other and with me about what they wanted to change. It’s such a powerful moment to me, to see when people become clear about what they would like to have happen. 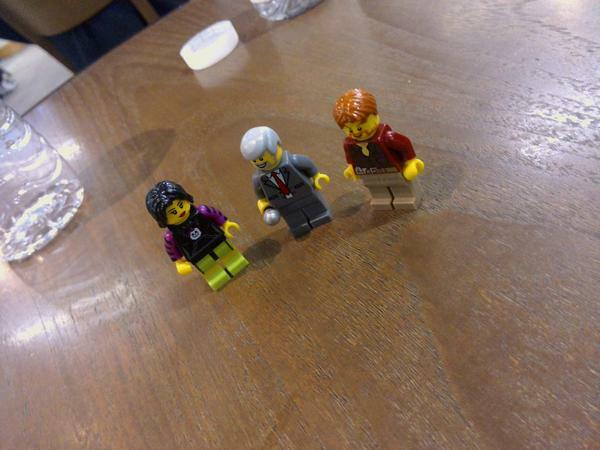 After a short break I had them do a mini-version of the ethnography workshop I conducted at #UXLibs. Karine Larose had been with us in Cambridge, as had Angus Brown in the Imperial leadership team. 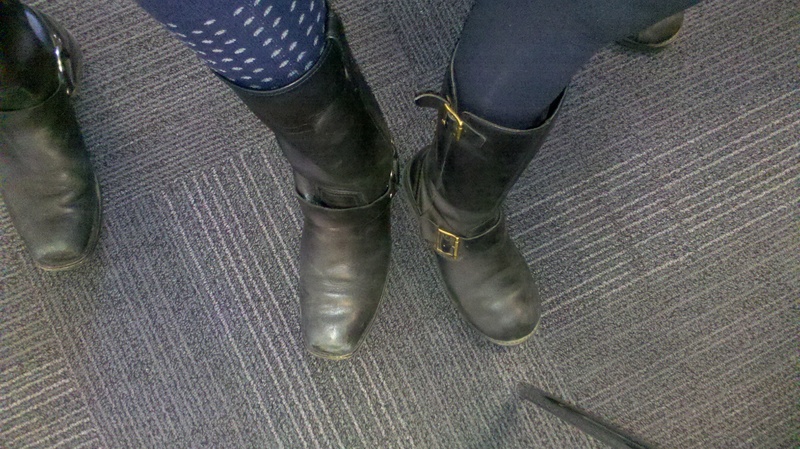 So Imperial is well-equipped with people to take ethnographic techniques forward into the work of the library. This time the observations were distributed throughout the library building, and because I wanted them to be able to apply the workshop to the specific Imperial Library context, we did spend time talking about what they saw, and what they thought it might mean. Once again 15 minutes of observations required far more than that of write-up time (let alone time for reflection, analysis, interpretation, and planning of next steps!). I think I’d like to have a workshop full of library leadership sometime, to have the people who need to make decisions about how staff spend time and resources experience the powerful potential of ethnography, as well as subjectively experience just how much time it takes to do effectively. Inspired by the concrete suggestions that people had taken away from the V&R workshop in Galway, and the morning at Imperial, I wanted the ethnography piece to have specific outcomes, too. So at the end we collectively thought about the questions that participants wanted to start to try to explore via ethnographic techniques at Imperial. And there was a definite impact, with staff members actively seeking out material to help them take ethnography further in their own work. Kingston University and UNC Charlotte have a formal exchange with each other, and I’m delighted to be starting to participate in conversations there around libraries and learning spaces. Thanks again to Robert Elves for being my liaison and scheduler. The final workshop I conducted was here, and I was once again fortunate to have 2 alums from the UXLibs conference, Sara Burnett and Simon Collins. We didn’t have time to do observations in the library sites this day, but spent good productive time having Sara and Simon go over some of the methods they learned at UXLibs. They also described some of the issues that they observed in the Cambridge libraries, and that led into a great discussion of what they were interested in exploring at Kingston. The outcome of this workshop was a document with a list of questions to start asking, with each question accompanied by the instruments/methods that might provide a good start in finding things out. Overall, it was just so much fun to not just talk ideas with people, but to take the ideas towards something that everyone agreed would be worthwhile to try. I was never in the position of telling people what they needed to do, but rather helped provide space for the conversation to happen, for people to connect with each other and with new concepts and to make new connections with things they had already heard before. It was satisfying work in a completely different way from report- or article-writing, or presentation-making. Thanks to all the institutions (NUI Galway, Cambridge, Imperial, Kingston) and people within them who provided me the chance for such work. it was practical in the best sense, and I hope I get to do more of that going forward. This entry was posted in Uncategorized and tagged #anthrolib, #LostMarch, #UKAnthroLib, #UXLibs, #VandR, libraries, library ethnography, London, presentations, travel, work on March 30, 2015 by dlanclos. 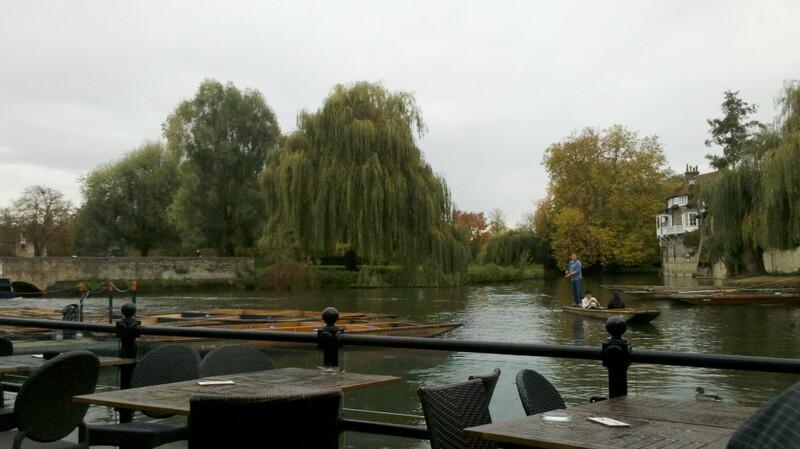 Punting on the Cam, which I will apparently get to do this visit to the UK. Well, it’s not going to be lost, but it’s definitely going to be a blur. I thought I’d put all of the things I’ll be up to the rest of this month here, in part to make it feel containable to me, and in part to inform people about where I’m going and why. 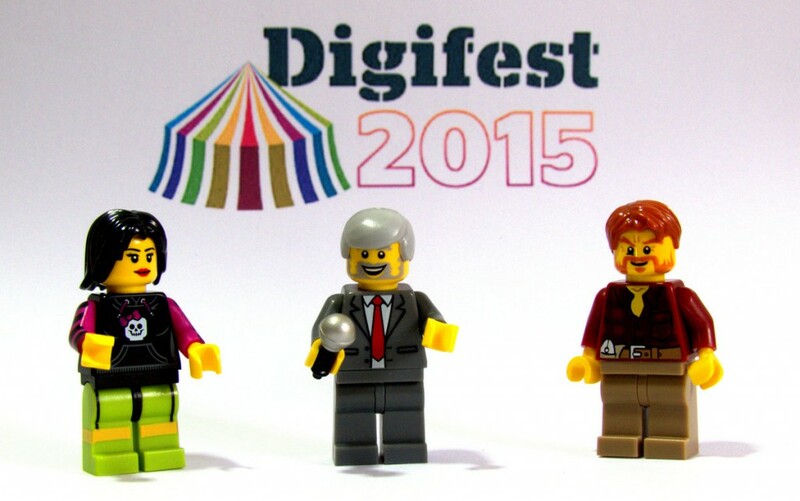 I’m delighted to be taking part, at Lawrie Phipps’ invitation, in a debate on education technology at Jisc’s second Digifest in Birmingham on March 9th. Dave White will be arguing for the question, “Are Learning Technologies Fit for Purpose” and I will be arguing against. Then I will be off to the west of Ireland, to chat with Catherine Cronin and colleagues about things library, ethnography, and education technology, as well as to co-run a Visitors and Residents workshop at NUIG on March 13th. And THEN I will be very excitedly keynoting at UXLib in Cambridge, as well as running one of the ethnography workshops on the first day, and participating in the rest of the 3 day conference (March 17-19) as mentor and judge. Andy Priestner and team have been working tremendously hard on this event, and I am grateful to have been invited to participate in it all. AND THEN I will be back in London for several days of conversations and workshops with my colleagues at the LSE, Kingston University, and Imperial College. I am disappointed I won’t have time to revisit my colleagues at UCL. That will have to wait for another trip. Finally, I’ll be presenting at ACRL 2015, with Andrew Asher, Maura Smale, Mariana Regalado, and Lesley Gourlay, a workshop based on on our collective work around cognitive mapping of learning landscapes. Our “Topography of Learning” workshop is on Friday March 27th, from 11AM to 12PM in the Portland Ballroom 253 of the Oregon Convention Center. if you will be in PDX for the meetings, do please come and participate! 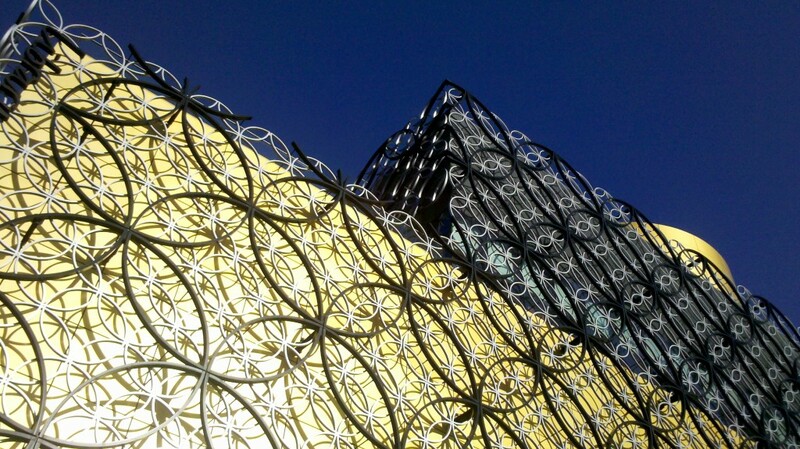 This entry was posted in Uncategorized and tagged #anthrolib, #digifest15, #excited, #LostMarch, #UKAnthroLib, #UXLibs, Cambridge, Ireland, library ethnography, London, travel on March 6, 2015 by dlanclos.